On March 13th, Ol' Myrt here will provide a virtual presentation titled "Where to Look Next?" 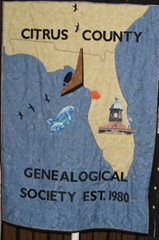 from her home in Utah to the gathering of the Citrus County Genealogical Society of Inverness, Florida. The meeting will be held at the LDS Church, 3474 W. Southern St., Lecanto, Florida beginning at 10am. When family historians hit the proverbial brick wall, it’s time to regroup and look again at a broad variety of record groups. Learn more about the locality where each ancestor lived, gathering clues about ecclesiastical and government jurisdictions, migration patterns, legal policies, and social customs, in addition to information about surviving records groups in local and regional repositories in manuscript, microform or digital format. Much of genealogical research isn’t about people, it’s about the places they once lived. Perhaps you’ve ventured out on the web to reputable websites like Ancestry.com, FamilySearch.org, FindMyPast.com (England, Wales), ScotlandsPeople.gov.uk and such. No single place on the web has it all. All too often beginning researchers think climbing one’s family tree is just a few mouse clicks away. Recent TV advertising for a major genealogy website mislead researchers by stating “You don’t have to know what you are looking for, you just have to start looking…”. And there are links for counties and towns for specific details. 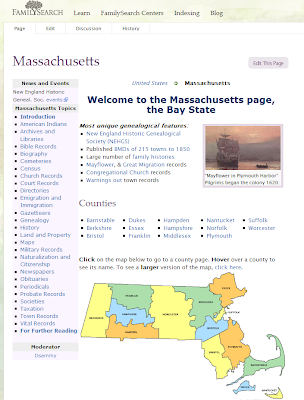 BELOW: A review of the section titled “Massachusetts – Military Records” on the wiki shows the following information about Colonial Wars. If you aren’t in Salt Lake City with access to the Family History Library books, the wiki informs you of titles that might solve your research challenges. Bodge, George M. Soldiers in King Philip's War. Baltimore, Maryland. : Genealogical Publishing Company, 1991. (Family History Library book 974 M2b.) A concise history of the Indian Wars of New England from 1620 to 1677. Contains lists of soldiers, stories of battles, copies of ancient documents relating to the King Philip's War, 1620–1677. MacKay, Robert E. Massachusetts Soldiers and Sailors in the French and Indian Wars, 1744–1755. Boston, Massachusetts: Society of Colonial Wars, 1978. (Family History Library book 974.4 M2mc.) Gives in-depth information about the years of turmoil among the French, Indians, and Colonists. It includes details about forming the militia force to combat the unrest. More ideas in the next blog post. But those places are only significant BECAUSE of the people who lived there! For me, Nagasaki, Japan, isn't important so much for the bomb we dropped there, but because my grandmother was born there. Genealogy research's PRIMARY purpose is the study of IDENTITY! Research the records of the locales where your ancestors dwelt and laboured, for it is part of Jurisdictional Research. Ol' Myrt here agrees 100%, DearDAE! When we hit brick walls its because we are looking merely for names, and don't yet understand the surviving records or how to access them. I'm sure we'll have much more to talk about over the next few weeks.